Two Henrys, three Catherines, two Elizabeths, two Marys, two Annes, two Janes and Edward: we all know the Tudors. They are big beasts of British history: only Alfred and his cakes, William and his conquest, Charles and Cromwell or Victoria with her Empire come close in our collective imagination. It would be easy for any display about the Tudors to stick to the familiar stock images provided by Holbein. Holbein is here but also smaller more intimate objects. 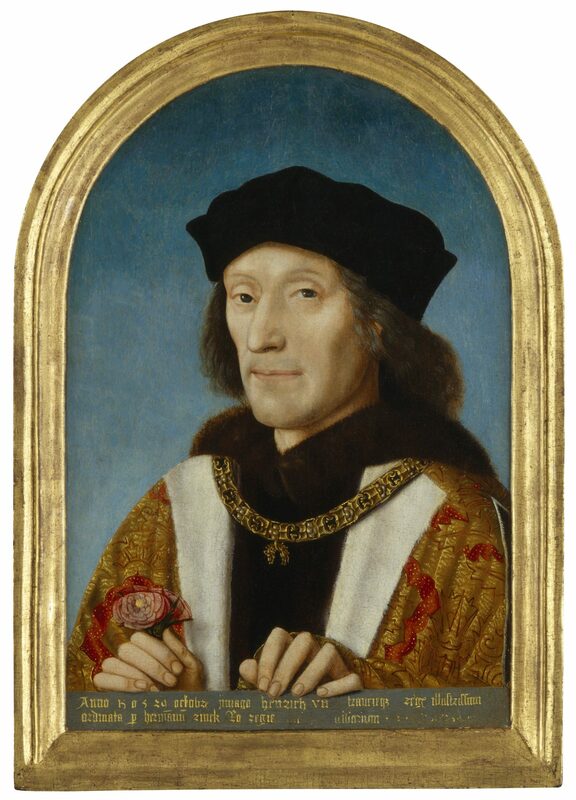 When Henry VII was widowed he didn’t have the benefit of match.com and had to rely on ambassadors armed with his portrait instead. They were dispatched to Margaret of Austria, Duchess of Saxony, who decided not to marry the king but kept the portrait anyway. More startlingly lifelike is a sculpture based on a plaster cast of the dead king’s face, in the half light of the gallery you half expect him to start talking to you. Displayed nearby is a Book of Hours given by Henry to his daughter Margaret when she left to marry King James IV of Scotland, in which he wrote ‘Remember your kind and loving father in your prayers. Henry King.’ It is amazing to look at the book and know that it was handled by the man whose lifelike face gazes down on you. Henry VIII is so familiar to us that seeing his portraits in the flesh is like leafing through a lavishly illustrated text book. What brings the man to life are the objects that he once handled. It is easy to forget that the founder of the Protestant Church of England was, in fact, a Catholic monarch for more than twenty years. His rosary is here to remind us of that fact, the largest bead is carved with the letters ‘he 8’ and ‘k a’. Edward VI was only nine when he ascended to the throne. His account of his accession, written in the third person and curiously impersonal, is on display. It is heartening to see that the handwriting of nine year old boys has changed little over the centuries. Also on display is one of my favourite paintings that when viewed from the front looks like a cartoon version of a boy with a very long nose but looked at from the side is a perfect portrait of Edward in medallion form. All the Tudor monarchs owned and wore a fantastic array of jewels but very few have survived. One such is a ring worn by Elizabeth, at first glance it looks to be simply an E picked out in diamonds but on closer inspection it is revealed to be a locket ring and inside are hidden paintings of Elizabeth and her mother Anne Boleyn. Elizabeth used portraits of herself to project the image of a powerful monarch but even after her death her successors continued to play with her image. A portrait of the Queen was restored for this exhibition and revealed that when it was painted soon after her death she had a wing-like structure behind her but it was subsequently painted over for an altogether softer and prettier image. Refreshment at the National Portrait Gallery comes with one of the finest views in London. At the very top of the building is the Portrait Restaurant and Bar with windows looking out over the rooftops of the National Gallery, past Nelson on his column and down Whitehall. Coffee, excellent cakes, a very formal lunch or early evening drinks can be had here. The National Portrait Gallery has a membership scheme, check out my London Museum Memberships post for details.